Kills wild blackberry, knotweed, scotch broom, & more. Specially formulated to kill tough invasive weeds & brush. 24 oz. bottle covers up to 57 sq. ft.
1 gallon bottle covers 300 sq. ft. Apply to the leaves of weeds in areas such as along fence lines, sidewalks, patios, mulch areas, recreational areas, & more. 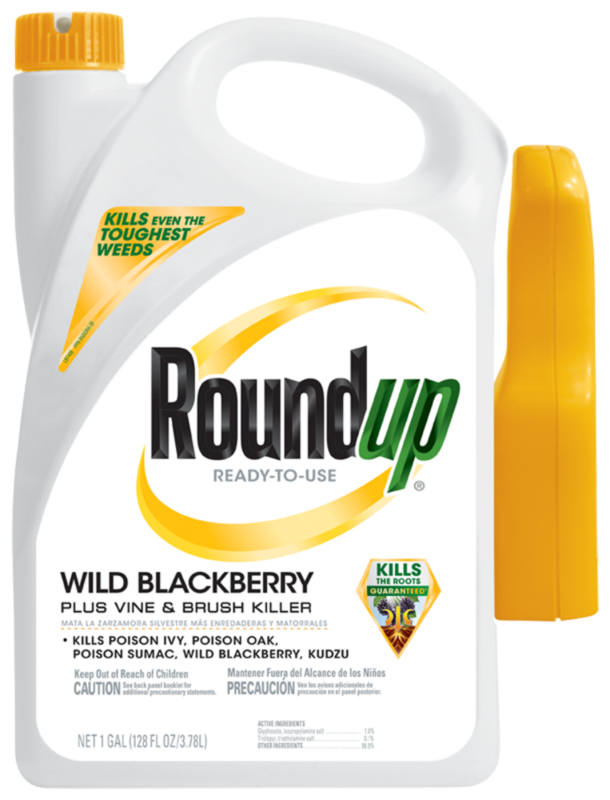 Remember Roundup is so effective that it will kill grasses too so it should NOT be used to spot treat in your lawn. For the 24 oz. bottle: Twist the nozzel to the open position. Squeeze trigger to spray unwanted weeds. For the 1 gallon bottle: Remove the sprayer from the side of the bottle. Pull cord/ tubing all the way out from the bottom of the sprayer. Insert the plug into the spout on the cap until it clicks. Flip the spout up. open the nozzle at the end of the sprayer. Squeeze the trigger to spray unwanted weeds & grass. People and pets may enter treated areas after spray has dried. Do not spray plants or grasses that you like - they will die. Do not use for vegetable garden preparation or in and around fruits and vegetables. Any time weeds are actively growing. Works best when there is little to no wind, temperature is above 60° & it's sunny. Whenever weeds are actively growing. Refill this container according to the directions contained in the REFILL section. If Empty: Place in trash or offer for recycling if available. If Partly Filled: Call your local solid waste agency for disposal instructions. Never place unused product down any indoor or outdoor drain. People and pets many enter treated area after spray has dried. Glyphosate targets an enzyme found in plants but not people or pets. Glyphosate targets an enzyme found in plants but not people or pets.